Set in a spectacular location right on the ocean this is a spacious villa that reflects luxury and comfort. The huge living room overlooks a wonderful gazebo and infinity pool surrounded by a beautiful tropical garden and the endless ocean beyond. Tastefully designed and furnished with accents of local Caribbean materials such as coral stone and hardwood. There is also a separate guesthouse perfect for visiting friends or family. 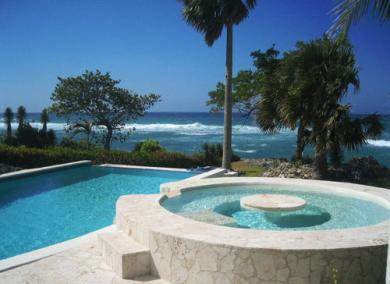 Located in the most exclusive gated community on the North coast and one of the few with ocean frontage. Contact us now for more details on this beautiful villa.